Review 10.1? The impression I get with the naming of this much-anticipated grown-up version of last year’s Galaxy Tab is that it has psychological hangups about (ahem) ‘size’. I imagine it loitering down the pub, boasting of its prowess: “It’s not just TEN inches, Al, it’s TEN-point-ONE!” It wants to be the Spinal Tap of Android Tablets, with Nigel Tufnel asserting that other 10in tablets only go up to, well, 10. You can’t blame Samsung for showing off its nice new screen size, though. 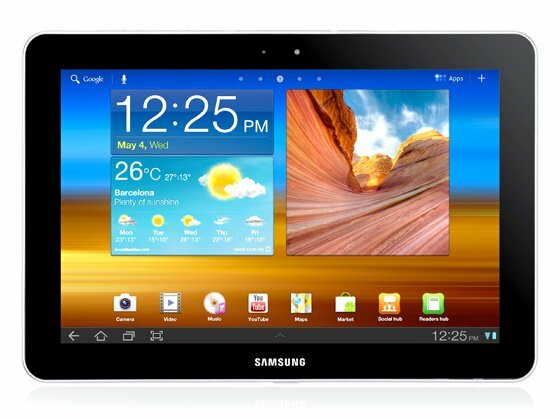 The original 7in Galaxy Tab was an interesting experiment in product design but it suffered from those mid-size blues: too big to be a phone, too small to be a netbook, and sporting an underpowered operating system in Android 2.2. This time round, Samsung has come up with a far better product in so many ways. The new 10.1in Galaxy Tab is faster, more stable, more capable, more versatile and actually thinner than the 7in pioneer. 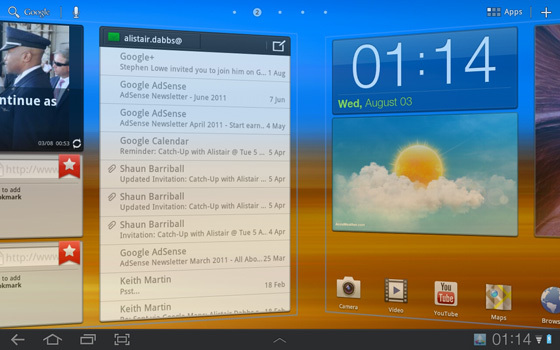 It’s also running Android 3.1. As in “Not THREE, Al, but THREE-point-ONE!” Since that extra tenth of an inch in the product name seems to matter so much, I’ll start with the screen. First up, the Galaxy Tab 10.1’s screen is the same size as those found on a raft of other 10in tablets, including the Asus Eee Pad Transformer, Acer Iconia Tab A500 and Motorola Xoom. In each case, the pixel resolution is the same too, at 1280 x 800. Do remember, though, that the Android 3.x (Honeycomb) operating system reserves 48 of those pixels along its bottom edge, in portrait and landscape orientations, for on-screen menu buttons. Practically all your apps are restricted to a on-screen area of 1232 x 800 or 1280 x 752 pixels. In landscape mode, that gives it less vertical resolution than Apple’s current iPads, which offer full-screen 1024 x 768 at either orientation. Owners of the 7in Galaxy Tab who were disappointed with its dark, grainy display quality will be much happier with the gleaming equivalent on the 10.1. That said, the product’s auto-adjustment feature constantly interferes with the brightness to the point of being distracting, so I switched that option off.